The GCS Lunch Club has been really well received by local diners! We have been getting lots of calls to book seats at our community tables and a few requests for private tables too! What is the difference between a community table and a private table? If you are wanting to meet new people, have varied conversations with people you may or may not know – then join in the community tables. If you are wanting to have a special lunch with a few friends or family members, perhaps a birthday or anniversary celebration – then book a private table we start at 4 diners for private tables and we can cater for bigger numbers on request! Lunch costs £4.75 per person and consists of a starter, main, dessert and to finish with a hot drink and chocolate treat! If you need transport it costs £2.00 return or £1.00 if you just prefer a one way bus ride! 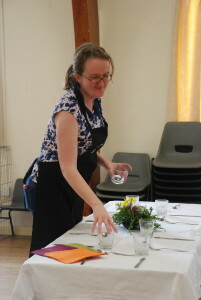 Next story 32 diners enjoyed our June GCS meal – well done to the team of volunteers who made it possible!